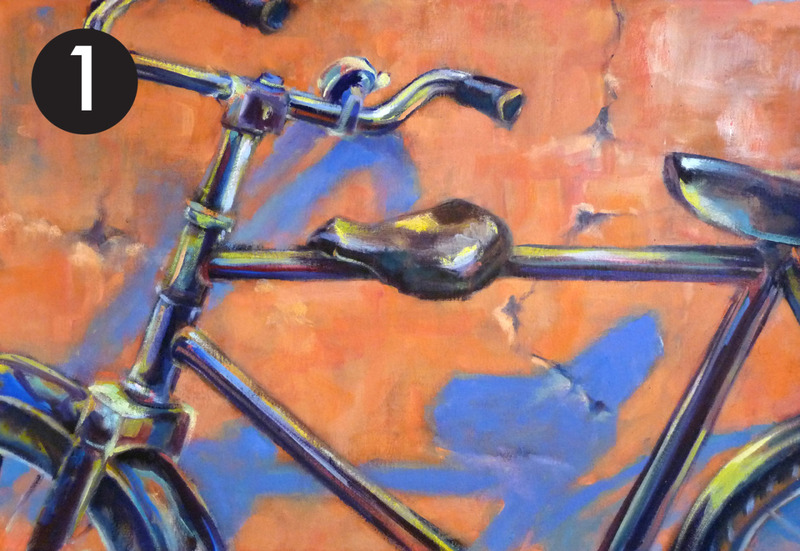 A few of my favorite paintings I’ve done are of bikes… or bike parts. The bicycle is such a blessing! Moving gears and parts allow us to sail on land! Wind in our faces and whipping up intense joy that just gurgles from deep inside. Pure delight sparks within seconds of pushing the pedals. I adore bicycles. I paint them a lot. 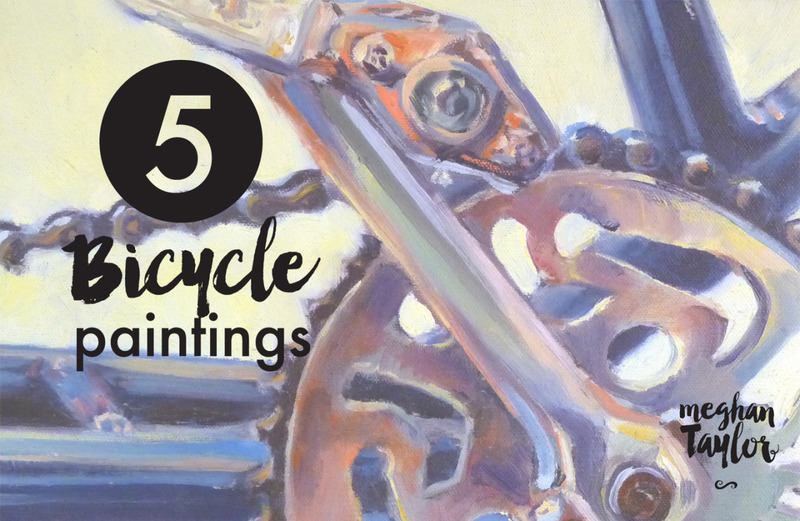 And each bicycle painting has its own story. 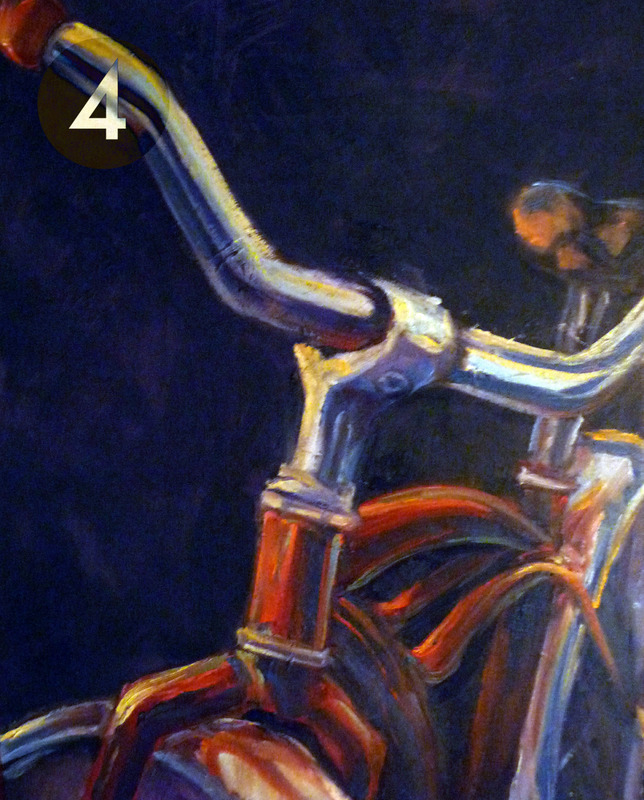 Bicycle 1: I travelled through India, where I was kinda sorta obsessed with the bicycles. They have a lot of personality and décor and varying use. This here bike, parked up against a beautifully peeling plaster wall, had a second saddle attached it. I call it The Makeshift Double Seater. Bicycle 2: When I got back from India, I was pretty much fascinated with the intricacies of bike parts. One day I found myself ordering a box of old bike parts from this guy off of Ebay. This provided much fodder for off-beat still-life paintings, of which this is my favorite. 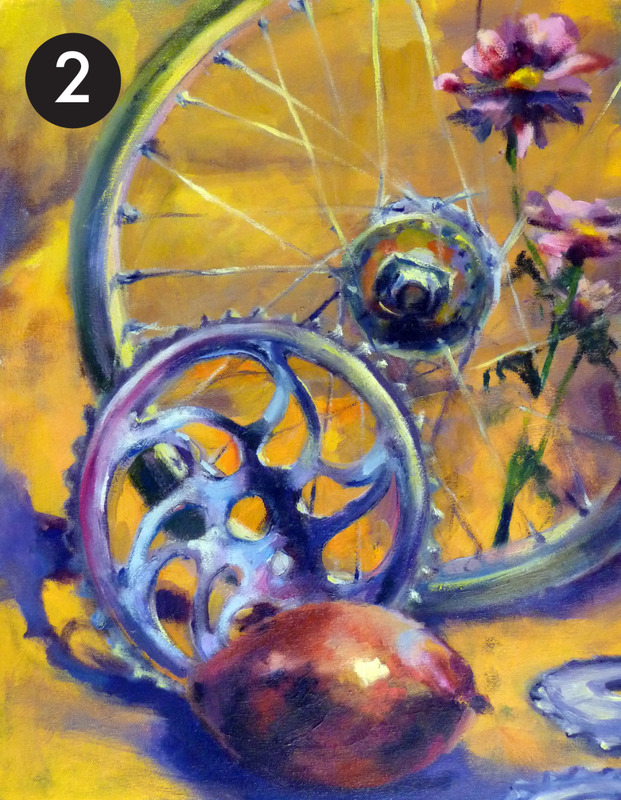 Bike parts paired with a mango and daisies. I call is Bicycle Mango. Bicycle 3: Another one from India. All of the bicycle cranks had gorgeous intricate cut-out designs. This is just one of them. Bicycle 4: Portrait of a Red Bike. Classic bicycle. Found it resting, safe and locked, against a street sign in Washington DC. 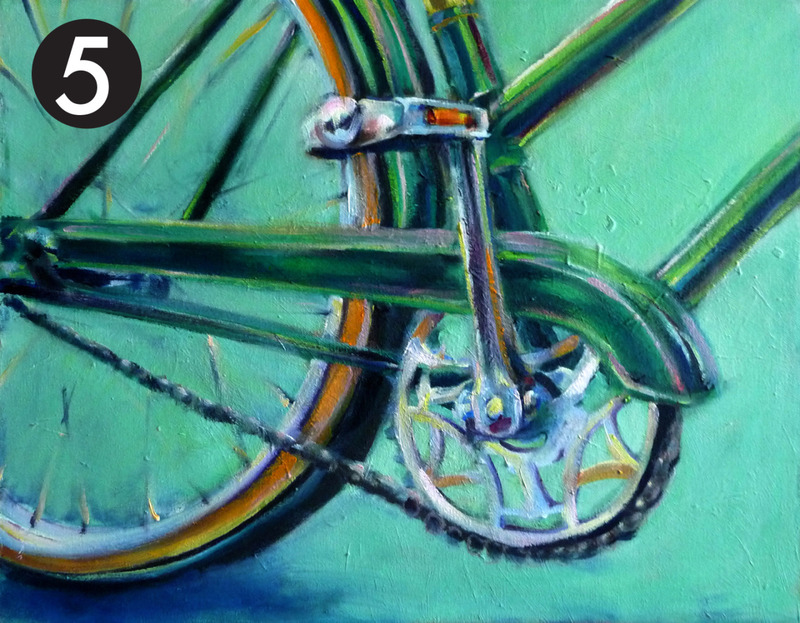 Bicycle 5: This painting is from a photo I took on Bike to Work day in Washington, DC. There were lots of fellow bicyclists around and one had a beautiful vintagey green bike. 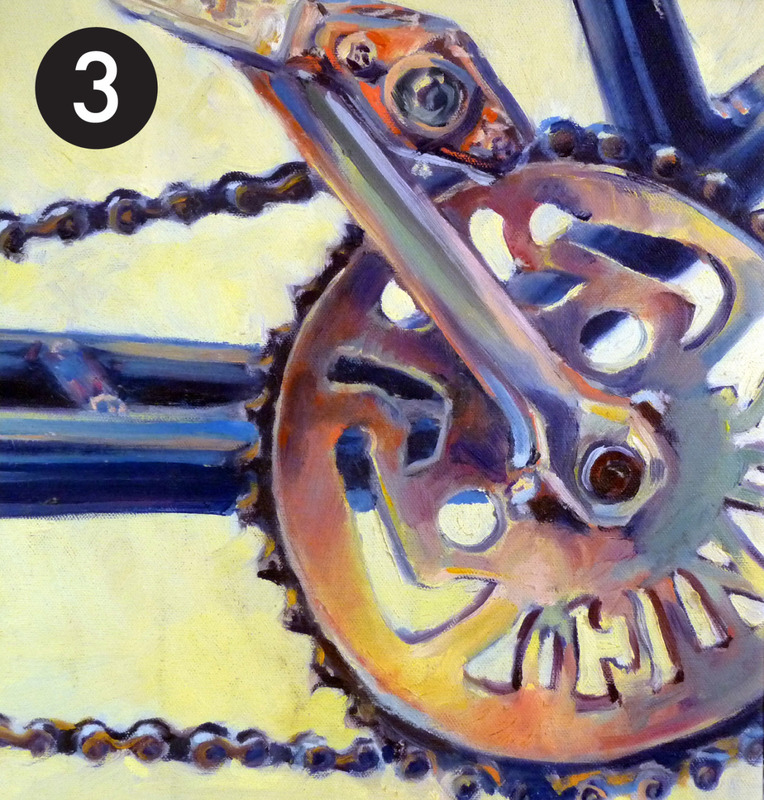 I loved the colors of the crank, and had to paint its portrait.